A country cottage is a place of respite from the daily grind, and its design should reflect this. 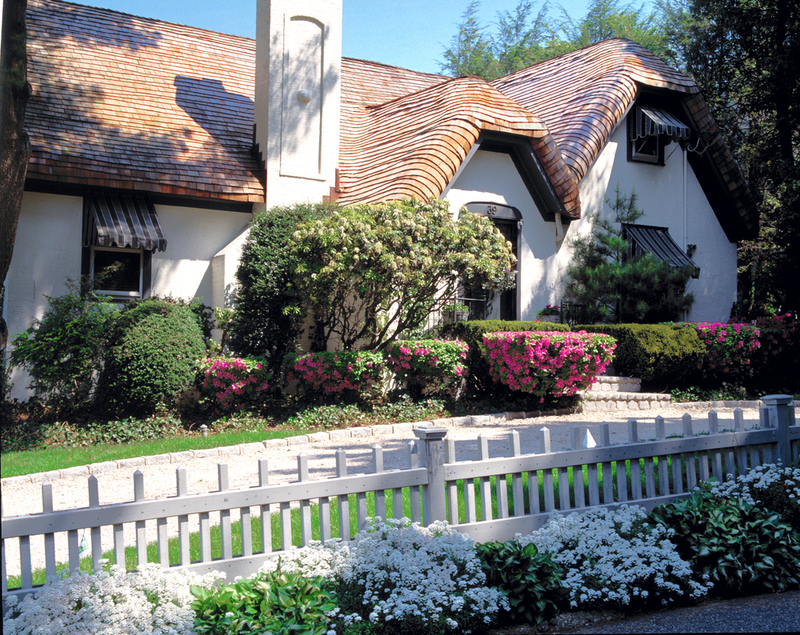 The Country Cottage Roof system from Custom Shingles makes it easy to create a roof with a character all its own. Gentle rolling curves and rich wood can turn any property into a place that instantly transports you far away from city life. What Is the Country Cottage Roof System? The Country Cottage Roof system is a full set of Cedar shingles, and the curved edge shingles needed to transform your home to a cottage you see in the storybooks, or what we call, the Country Cottage Roof. The pre-bent shingles are what set these roofs apart, and allow you to create rolling eaves and gables that contribute to an overall sense of harmony with nature — a convenient package perfect for vacation houses, rural homes, museums and other properties. Please note, special curved edge framing is required for these roofs, which can be added to a traditionally framed home, please contact us for details. Custom Shingles will work with you to determine your specific package needs and provide appropriate assistance at any stage of a project. We’ll supply the shingles and other products, and can oversee the installation of a new or restored roof or provide consulting around any engineering challenge you face. 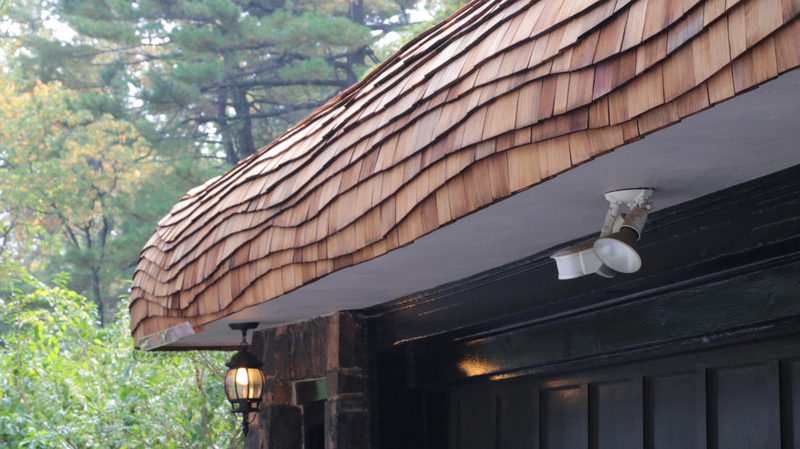 We are unique among roofing companies in that our focus is almost exclusively on high-end wood products. The Country Cottage Roof system is one of our most popular product offerings, and an efficient, excellent choice for any builder, architect or homeowner. The Country Cottage Roof system includes curved eave shingles, curved gable shingles, curved ridge shingles and 'up's and 'downs' for use in the hip and valley areas of your roof. We also sell pre-assembled fascia boards and gable sections that can be easily attached to an existing roof frame, cutting down on the time and expense required to complete your project. Individual shingles and shakes can be cut to any profile in the Fancy-Cutt™ product line, or to a custom shape of your own design. Our curved gable shingles can be found on luxury resorts around the world, as well as private estates and residences. Curved gables are an important component of storybook homes, Tudor revival buildings and even more contemporary builds. 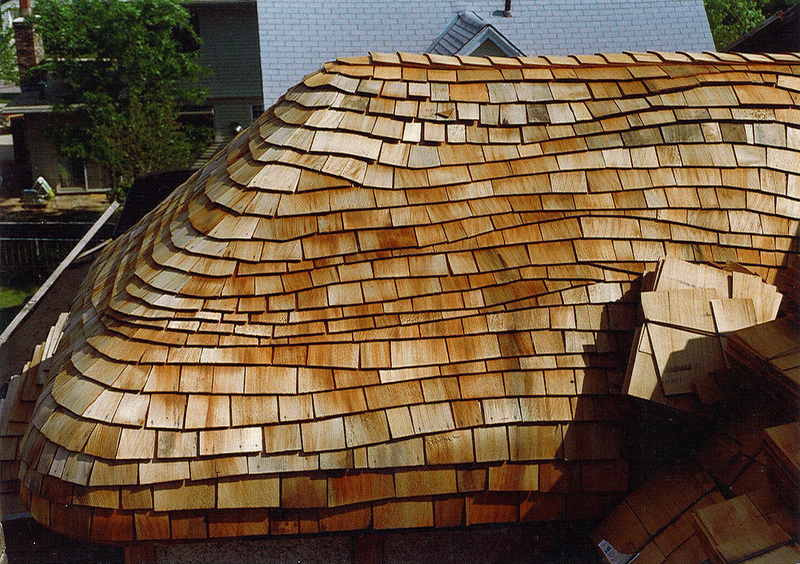 The possibilities are limitless when you work with Custom Shingles! Get inspired by visiting our Portfolio Gallery or by speaking with a representative directly to discuss your idea. Our advanced customization capabilities make us the ideal partner for demanding historical restorations. Custom Shingles was chosen to restore the Cedar roofing on the Chapel of Roses, a church in the English Tudor style designed by noted architect Francis Harvey Slocombe. This project involved precision bending Cedar shingles to recreate the idiosyncratic curves found along the building’s gables, eaves, ridges and hips. Photos of the impressive end result can be seen in our blog. Minimum order amounts for select curved shingle products are as small as one box. We are happy to provide sales and service to homeowners, architects, contractors and other clients around the world. Get in touch with a Custom Shingles representative to find out what we can do for you. Western Red Cedar is our most popular shingle material, as it is abundant, cost-effective and possesses excellent natural resistance to decay. We also offer shingles in Alaskan Yellow Cedar, which is more finely textured and better at repelling moisture, and Eastern White Cedar, which has a more neutral color that takes well to stained finishes. Other options include exotics, such as Teak and Wallaba, which contain oily resins that provide superior protection against weather damage. When natural wood isn’t an option, we can also provide high-quality composite curved gable shingles that offer all the benefits, as well as the unique look, of Cedar. Any shingle or shake can be pre-stained in your choice of colors, or treated with fire-retardant or anti-mildew products for additional safety and longevity.